In 2014 Craven came up with an environmentally friendly alternative to sending Christmas cards and took it to an online vote to let their customers decide which charity should receive a £1000 donation. Craven customers took part in an e-vote between Cancer Relief UK, Great Ormond Street Hospital and Shelter. Shelter had the most votes and received the £1000 donation. Shelter is a charity aimed at helping millions of people each year who are struggling with bad housing or homelessness. Providing advice, support and legal services. Following the success of the 2014 appeal, Craven took it back to an online vote in 2015. Martin House Children’s Hospice was decided the winner. Martin House provide family led care for children with life shortening conditions. It is a place where children and their families can go to stay from time to time and find support, rest and practical help. 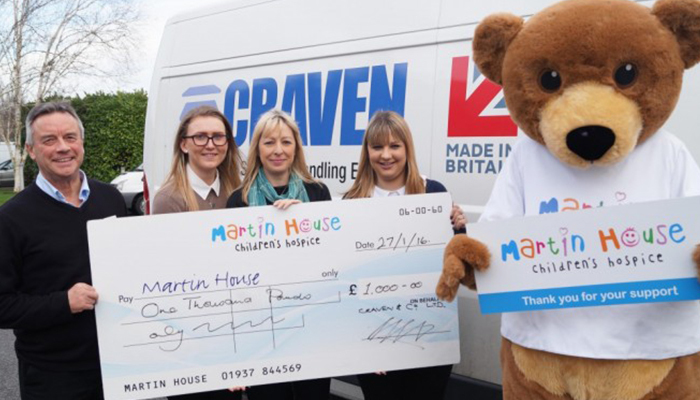 Finally, in an attempt to raise more money for this cause, one of the Craven team donned the costume of ‘Marty Bear’ – the Martin House resident mascot. Guess who is in the costume for the chance to win a luxury hamper!